The movie narrates the story of 11 valiant freedom fighters and their struggles against the Pakistani occupation forces. Chashi Nazrul Isalm was always fond of war movies and was a regular viewer of movies like the Cranes Are Flying, Two Women, The Longest Day, The Fall of Berlin. These war movies had a big impact on him and he wanted to make a war movie ever since. 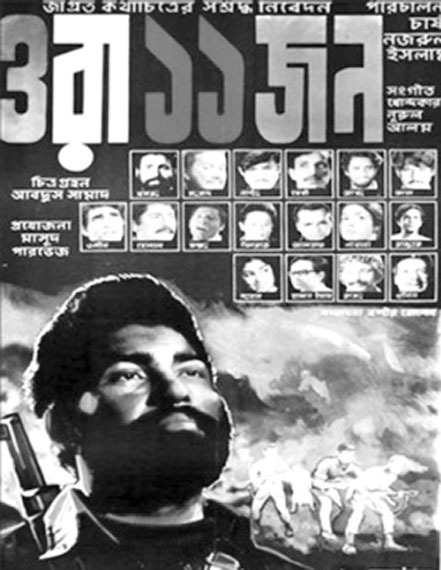 When the Liberation War began in 1971, Director Islam and lead actor Khosru were both members of Mukti Bahini (liberation army) in the Liberation War. Islam decided that if he could survive the war, he will make a movie based on the Liberation War of Bangladesh which will tell the true story of the war. When the war ended on December 16 and the Pakistani occupation forces surrendered, he went to actor Khosru on December 19. Khosru was then a student leader and freedom fighter. Islam expressed his desire to make a movie on the 1071 Liberation War. Khosru agreed instantly; however, making a movie needs a lot of money. The first task was naming the film. Chashi drew inspiration from the 11 point movement of Bangladesh Chhatra League; also, the fact that the war was fought in 11 sectors played into the inspiration. So, he came up with a name which had the number 11 in it. Thus, Ora Egaro Jon title came up. They needed 11 freedom fighters for the movie. As Khosru was a freedom fighter himself, he did not take a long time to find the crew and they began the shooting on February 21, 1972. They used live ammunition and firearms for the shooting of the film. Everything was real. As all the actors were young freedom fighter, they did not pay much attention to the risk associated with using of live ammunition in the shooting. Even though Ora Egaron Jon was made in 1972, till date, the war scenes in the movie remain some of the best ever shots in a Bangladeshi movie.